The expansive role of the Indian private sector in contributing to an improved and sustainable future can be gauged from the preceding years’ investment of approximately USD 942 million in corporate social responsibility activities. Multiple stakeholders, including the government, academic institutions, non-governmental organizations and others, are also strengthening their collaboration with the private sector to pursue common goals. The CGIAR Research Program on Climate Change, Agriculture and Food Security (CCAFS) in South Asia has joined these collaborative efforts, together with a multi-business conglomerate called ITC Limited, with the aim of reinforcing efforts to develop climate-resilient agriculture and rural livelihoods in India. With a keen interest in strengthening rural livelihoods, ITC is invested in agri-business with the aim of attaining economic, environmental and social gains through its business models (the 'triple bottom line' approach). ‘Mission Sunehra Kal’ (MSK) by ITC is a means to that end, through which rural livelihoods are getting a boost from information and communication technology-based services, wasteland development through social forestry, soil and moisture conservation programs, livestock development, etc. ITC’s outreach areas in India span diverse agro-ecological zones, such as the states of Rajasthan, Madhya Pradesh and Maharashtra, which have agriculture systems highly vulnerable to climate change impacts. With the common goals of promoting resilience in agriculture and enhancing livelihood opportunities, CCAFS' Climate-Smart Village (CSV) approach and ITC's MSK have joined forces in a project titled Developing resilient agriculture to climate change in India. Evaluation and evidence: Generating evidence of improving farm productivity, income and resource use efficiency, thereby helping initiatives to reach scale. The model identified for implementing the project interventions can be termed the ‘hub and spoke’ model. 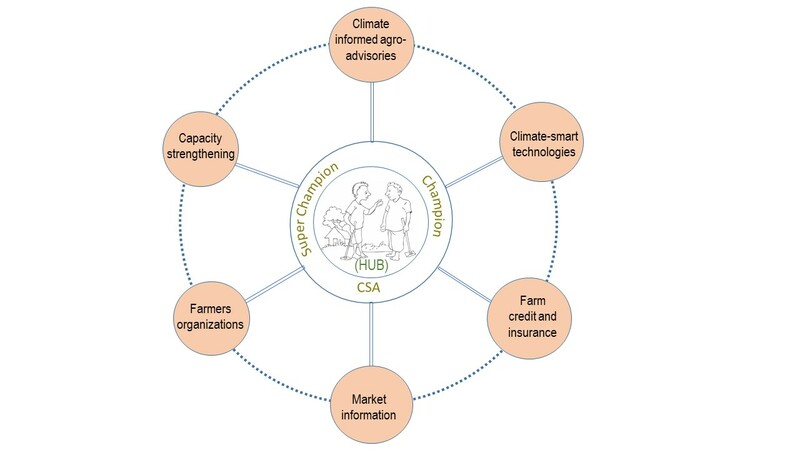 The hub comprises farmer groups who will implement different portfolios of CSA practices and technologies. In this model, evidence on what works from the 'hub' will be shared through the 'spokes' with other farmers in the same or neighbouring villages. The 'spokes', or different methods for sharing, include on-site demonstrations, participatory videos, and capacity building trainings, etc. For the current project locations, the locally contextualized CSA portfolios chosen can be divided into yield-improving technologies and practices (improved and resistant varieties of seeds, precision nutrient management, intercropping, irrigation and drainage management) and climatic risk reduction technologies and practices (water use efficiency, contingent crop planning, ICT-based agro-advisories, crop insurance, capacity training). These portfolios supplement ITC's MSK activities in the project sites. Early results are promising, with significant improvement being shown in the yields of crops like soybean, wheat and paddy, increasing farmers' incomes in the process (see the project brochure for more details). Besides aiming for resilience building throughout the entire agricultural value chain, the project promises collateral benefits like information generation, institution building and capacity development of project staff among others. Through mediums such as 'e-choupal' (an initiative by ITC to establish direct linakge with rural farmers for procurement of agricultural produce) and farmers’ WhatsApp groups, regular information on CSA technologies and market access is being shared with and among the farmer beneficiaries, contributing to better decisionmaking. The project has also facilitated the formation of local, farmer-led institutions like the Jal-Jameen-Jangal Samiti (institution for water-forest management), farmer producers' organizations, and women farmers' groups, which are infusing a new spirit of enterprise and cooperation among the farmers. Finally, regular capacity building exercises are being undertaken with the staff of local partner organizations as well as with ITC field staff to help hone their skills in project cycle management of climate-smart agriculture.